EA has revealed some interesting launch numbers for BioWare's latest, as well as how many gamers shelled out for its day-one DLC. 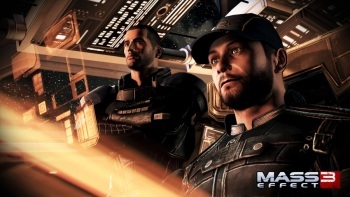 In celebration of a successful launch, EA has revealed that 3.5 million copies of Mass Effect 3 have been shipped worldwide, while nearly 900,000 were sold in the North America on day one. Speaking of day one, EA also revealed that 40% of gamers picked up the game's increasingly controversial launch DLC, From Ashes, meaning that regardless of various online rage vents, a ton of people still forked out for the content. One might even say that offering the early bonus mission was ... wait for it ... Massively Effective. As part of its announcement, the company also boasted its over thirty perfect review scores, with the Xbox 360 version earning an average rating of 9.5/10. "We have been truly humbled by the amazing response from fans and critics for Mass Effect 3," said BioWare co-founder Dr. Ray Muzyka. "The game is a gripping, engaging experience where the decisions and choices you make will truly stay with you for the months and years ahead. We are all incredibly proud of Casey Hudson and the teams in Edmonton and Montreal for delivering the best game BioWare has ever made." While not all of those 3.5 million discs represent sales yet, EA wouldn't have shipped them if it didn't expect to sell them. If you consider that this number is only indicative of very early figures, and that it fails to account for any digital sales through Origin and other online retailers, I think it's a safe bet to guess Mass Effect 3 is pretty popular right about now. It seems as though those user reviews on Metacritic aren't very indicative of the gaming community's actual interest after all. Huh.